Reflects bright white when photo-flashed or illuminated with flashlight. Ideal for low light areas to create a "beam of light" with string. Indoor or outdoor use: Made with sturdy nylon. Many versatile applications: Trajectory, Blood Spatter, Tire Tracks on dirt, Evidence Marking, etc. 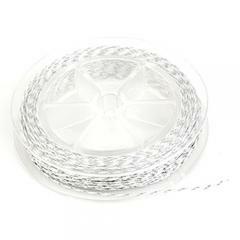 Add Reflective String to your existing EVI-PAQ String Kit, simply place spool in an end slot.